The New StudioBinder is Here. 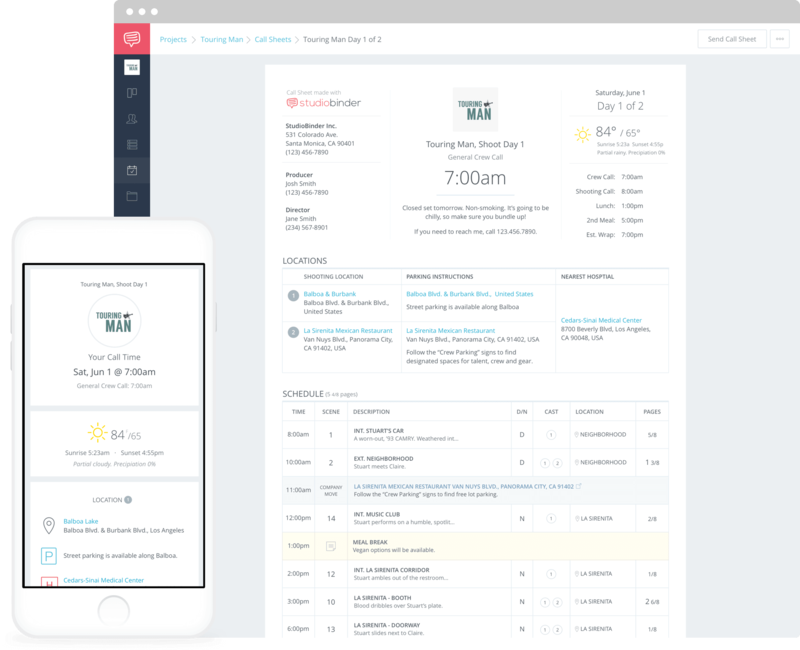 It's faster and more intuitive to manage contact and create call sheets. The latest version of StudioBinder comes with several changes and a more refined user experience to help you get things done faster. Take a look at our video demo to see an in-depth walkthrough of the new user interface, new contact and department features, and an even more intuitive call sheet builder. Here’s a breakdown of the improvements that are live on StudioBinder right now. The new version of StudioBinder maximizes space better to show more information on screen. This means less scrolling. Less clicking around. There’s a new collapsable sidebar to free up some space. Contact details are more compacted to showcase more contacts per page. A brand new Project Overview page summarizes key project metrics at-a-glance. Previously, if you were working on productions with a large crew, it would be time-consuming to sift through a long list of contacts. In the new StudioBinder, contacts can be filtered quickly via a brand new contacts sidebar. Adding new contacts are much snappier now as well. They pop up faster, and we’ve removed phone numbers as a requirement. We’ve also included a new “Save & Add Another” button, it’s faster than ever to add contacts back-to-back. Lastly, we’ve merged Favorites Lists into the new Contacts page so it’s easier to keep your contacts organized without leaving the page. Crew are grouped in departments for you! Crew members are now automatically grouped into departments for you! This applies to contacts pages AND call sheets. This means less time adding custom roles and reordering them over and over again. Want to edit the departments names, crew positions, and hierarchies? You can do that too. A new Department Settings page makes it easy to customize departments and positions. You can edit default departments and positions across all projects, or just at a project level. Previously, when adding a new contact to a call sheet, you’d need to exit the call sheet builder, and then return to assign them as recipients. While this worked well enough, it added a lot of clicks to the process. The new StudioBinder makes it a breeze to add new contacts on-the-fly without exiting the Builder. Additionally, call sheets now display clients and extras in separate, dedicated grids, so they’re no longer lumped in with crew. Crew members are automatically broken down by departments and hierarchies for you. So not only is it easier and faster to create and edit call sheets, it’s also more intuitive to read call sheets since contacts are bucketed more appropriately. Add PDF breaks in the "Feature Film" template. If you have access to the Feature Film Template, you can now add PDF Breaks anywhere you want. You can also choose to display phone and email addresses for crew members. Expanded visbility and control over call sheet recipients. We’ve overhauled the the Call Sheet Recipients page. Add call sheet recipients on-the-fly without need to enter the Call Sheet Builder again. Remove recipients with 1 click. Send and Resend call sheets individually or in bulk. Excited? Here's 25% OFF the next 2 months, on us. The above are the most noticeable changes we’ve made to StudioBinder. Along with the visual changes, we made a series of “under the hood” optimization to make the StudioBinder perform better, and is a big part in laying the foundation for what’s coming next. Let us know what you think about the new features and improvements on our Facebook page! For a limited time, we are offering 25% off 2 months on any plan with promo code EOY25FOR2. Login now to see with these features for yourself. And make sure to let us know what you think! Like these updates? Share them!